The country’s first living flag which can be found at the Ayala Triangle Gardens in Makati City was launched on June 7, 2010 in preparation for the Philippine Independence Day on June 12. The living flag, measuring around 150 square meters was made with almost four thousand flowering plants. “Since the Gardens opened to the public in 2009, it has provided a green refuge for urban dwellers and has served as a venue for shared experiences in Makati,” says Meean Dy, head of Ayala Land’s Strategic Landbank Management Group. Ayala Land also launched the “I he(art) Makati. I heart the Philippines. I heart being free” series of events that hope to showcase the Gardens and celebrate the Filipino spirit. The Ayala Triangle Gardens, the city’s main cultural and civic hub will serve as the backdrop to the living flag, its lush foliage and spacious lawns perfectly complementing the creative display of nationalism. Adjacent installations are also displayed that provide historical facts and tidbits about the Philippine flag. It is already common to see our pedestrian underpasses filled with advertisments of consumer ads. 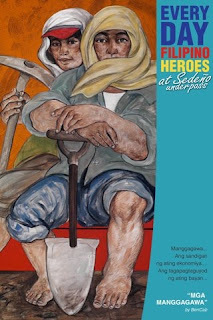 But this time, the first-ever underpass was turned into an art gallery at the Makati Central Business District with two exhibits: “Looking for Juan” at the Legazpi Underpass and “Everyday Filipino Heroes” at the Sedeno Underpass. Both were launched on June 7, 2010. Coinciding with the celebration of the Philippine Independence Day, the project aims to make art more accessible to the public (because only a few get to visit art galleries & museums) and to liven the pedestrian experience. The Legazpi Underpass crosses Ayala Avenue from Legazpi Village (near Locsin Building) to Ayala Triangle, while the Sedeno Underpass crosses Paseo de Roxas from Sedeno Street to Ayala Triangle. Ayala Land and Alveo, in collaboration with Center for Art, New Ventures and Sustainable Development (CANVAS) and Makati Commercial Estate Association, will line the underpass walls with selected artwork from CANVAS’ previous exhibitions (“Looking for Juan” – April 2009, Cultural Center of the Philippines and “Everyday Filipino Heroes” – May 2010, UP Vargas Museum). Curated by Marika Constantino, the exhibit featured works by Bencab, Elmer Borlongan, Sajid Imao, Plet Bolipata and other prominent artists. “Looking for Juan” is a collection that attempts to answer what a Filipino is, while “Everyday Filipino Heroes” portrays heroes like teachers, doctors, etc. we encounter on a daily basis. The project also promotes education and sustainability, as children’s books published by CANVAS were donated to Makati public schools, while tarpaulins used at the exhibit were recycled into art tote bags. A non-profit organization that trains women’s communities in Antipolo and Laguna, spearhead the initiative to convert the tarps into bags. 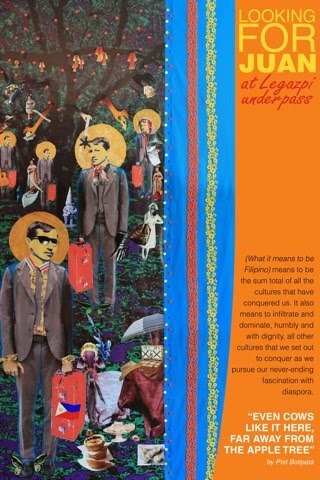 For more information, visit www.iheartmakati.com or email atg@ayalaland.com.ph or call (632) 8415812.